Today, July 20th, there has been heavy fighting in the Gaza City neighbourhood of Shuja’iya. 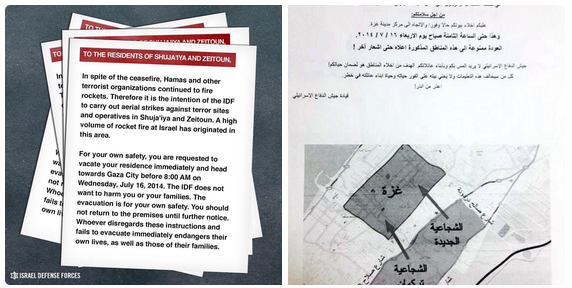 As was noted here yesterday in relation to a BBC article about that neighbourhood, its residents received notification via leaflets, telephone calls and announcements in the Arabic media that evacuation was advised four days previously on July 16and operations were even delayed in order to allow more civilians to organize their evacuation. With Hamas’ propaganda department already trying to persuade the world of a “massacre” of civilians in Shuja’iya, one can only hope that BBC correspondents on the ground will have the good sense to remember how their colleagues unquestioningly reported similar claims in Jenin twelve years ago without bothering to check facts first. 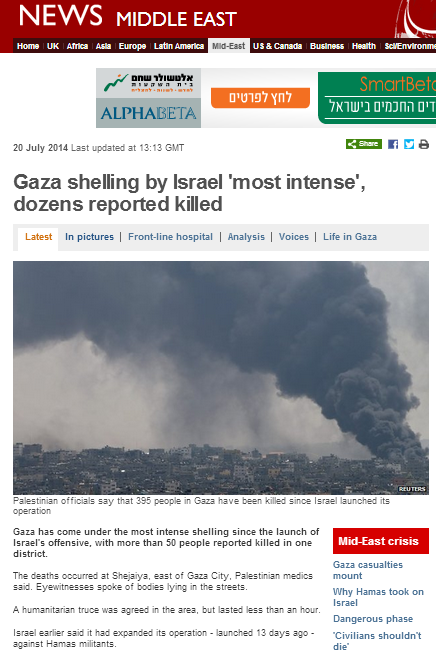 The reporting which has appeared on the BBC News website so far includes an evolving article now titled “Gaza shelling by Israel ‘most intense’, dozens reported killed“. That report once again repeatedly cites casualty figures for which there is no evidence to suggest the BBC has independent verification and – as has been the case in all the BBC’s reporting so far – no effort is made to inform audiences of the sources of those figures and their questionable reliability. Gaza has come under the most intense shelling since the launch of Israel’s offensive, with more than 40 people reported killed in one area overnight. But the death toll continued to rise at the weekend, with the number of Palestinians killed now 395 since the operation began, according to Palestinian health officials. As we see, yet again no effort is made by the BBC to distinguish between civilian and combatant casualties. Much of this article is devoted to descriptions of fleeing civilians, as were Tweets posted by BBC correspondents on July 20th – see for example here, here, here, and here. If the BBC has made any attempt to determine whether those civilians did not evacuate the neighbourhood previously when warnings were originally given because of Hamas orders to stay put, those efforts are not apparent in this article, but of course BBC reporting from the Gaza Strip over the past thirteen days has systematically ignored the issue of the use of the local population as human shields by Hamas and other terrorist organisations. When we arrived at the edge of the neighbourhood, Palestinians were still fleeing in their hundreds: carrying nothing but their children, some pausing to vent their anger in front of cameras. They spoke of bodies lying in the street and the wreckage of buildings, including a mosque. After a night of ferocious bombardment, they seem traumatised and stunned. For three days, Israel had warned them to leave their homes, but Shejaiya is home to 80,000 people. Most stayed put, not expecting the ferocity of last night’s bombardment. One man, his eyes glassy, said his father had been killed. He didn’t know where other family members were or even if they were alive. An elderly woman, in traditional Palestinian costume, raised her arms to the sky and asked how God could let this happen. A handicapped girl winced as she was lifted into the back of a pickup truck. “The Israel Defense Forces (IDF) sent ground troops into Gaza on Thursday after 10 days of heavy air and naval barrages failed to stop rocket fire from Gaza. Israel says the ground operation is necessary to target Hamas tunnel networks, which it says it could not do from the air alone. Two Israeli soldiers were killed on Saturday during a gunfight with Palestinian militants who had used tunnels to cross into Israel to launch an attack, the IDF said. No attempt is made to clarify to readers that as well as being a significant site of Hamas command centres, weapons storage, missile manufacturing facilities and the launch site of some 140 missiles fired at Israeli civilians since the beginning of the current operation alone, Shuja’iya neighbourhood also houses the entrance to some ten of the tunnels that the BBC has so far avoided adequately informing audiences about. 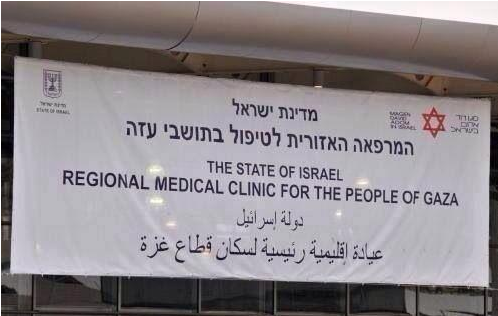 Notably too, the BBC is very coy about clarifying to readers that Hamas opened fire at Israeli troops in the vicinity of Wafa hospital in Shuja’iya during the two-hour humanitarian hiatus (later extended by one hour) it had requested. “A few hours later, it agreed to a two-hour humanitarian truce in Shejaiya. The ceasefire would last from 13:30 to 15:30 local time (10:30-12:30 GMT), an Israeli military spokesman said. So whilst BBC audiences are provided with unverified casualty numbers and emotive reporting on the topic of fleeing civilians, they have not yet been provided with the all-important context of the reasons for the need for military action in Shuja’iya and they have still not been provided with an adequate overview of the topic of Hamas’ tunnel network, the threat it poses to Israeli civilians and the reasons why the existence of those tunnels makes a ground operation necessary. That conclusion fails to adequately clarify to BBC audiences that the suffering of civilians in the Gaza Strip could have been avoided in the first place or brought to an end almost a week ago, but that Hamas chose otherwise.